The install is easiest done with the ICM removed from the engine. While there be sure to check and clean the grounds for the ICM. Remove the coil pack and set it aside, it is not required. Cut the extra two fast-on terminals off, only the one left is required. If you don't want to cut them off, use some heat shrink to completely insulate them. Those terminals are +12 volts to the former coil pack. Using four of the small screws attach the four spacers as shown. Note that the lower mounting board is symmetrical, there is no top, bottom or end to end differences. Just pick it up and use it. Set the CnP Interface board on top of the spacers and check that the mounting screw holes line up with the spacers. If not, loosen and adjust the spacers. Feed the wires through the center opening and place the mounting board on the ICM. Place the CnP Interface board as shown and route the black wires with the ring terminals as shown. Thread the two large screws into place and leave loose. Align the four outer mounting board holes with the holes in the ICM. Tighten the screws retaining the ring lugs. Press the fast-on terminals onto the tabs on the bottom of the CnP Interface board. 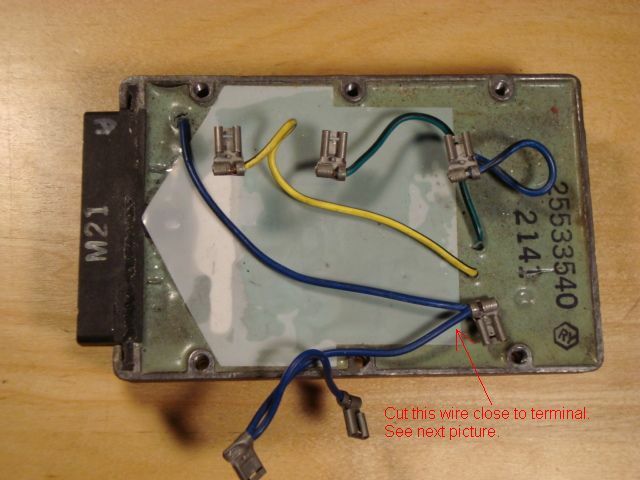 Note that the wire colors are labeled on the top of the board. They go in the same order as if they were being attached to the coil pack. Mount the CnP Interface to the spacers via four small screws. With the exception of a cover the CnP Interface mounting is complete. Note that there are three LEDs on the board. These will blink in sequence once the cam & crank sensors are recognized by the ICM. This is for basic troubleshooting, if they don't blink then the input signal from the ICM to the CnP Interface is not present. Before the cover is installed you can temporarily install the ICM with the CnP interface. Pull the injector fuse (INJ/FP) and crank over the engine. The LEDs should blink in sequence. No need to connect to the coils for this test. The cover, four long screws, four internal tooth lock washers, four fiber washers. Slot in one end of cover for wires to exit. There is a rubber grommet protecting the wires. Use caution as to not rip or tear the grommet when inserting it into the slot. Place the toothed washers onto screws first followed by the fiber washers. The screws are tricky to start into the ICM threaded openings. Drop them into the holes in the cover and place the cover over the ICM. Then lift the cover a little so that you can see where the ends of the screws are. Start them into the ICM, once all four are started then snug them down to clamp the cover. With the exception of the two side cutouts the interface is fairly well sealed. A dab of black RTV (silicone sealer) on the two cutouts will seal those areas. And blend it in with the rest of the cover (color wise). Install the ICM/CnP Interface set up back onto the engine.